National Bank of Oman’s (NBO) new headquarters designed by LOM architecture and design, FDP’s sister company, is a finalist in Commercial Project of the Year category of the Construction Week Oman Awards 2018. The dramatic structure – with a total area of approximately 50,000 sq m (540,000 sq ft) across nine floors (seven above ground level) – stands on a prominent site on Al Sultan Qaboos Street, near the Grand Mosque and the city centre. Its scale and location make this one of the most important new buildings in Oman in recent years. The jury for this year’s seventh annual CW Oman Awards features high-profile industry experts and business leaders – including analysts, consultants, and legal experts – from across the Middle East’s construction sector. The winners will be announced on Monday 12 March 2018 at the Grand Hyatt hotel in Muscat. More than 200 decision makers will gather at the grand finale to celebrate the achievements of construction professionals from round the sultanate. 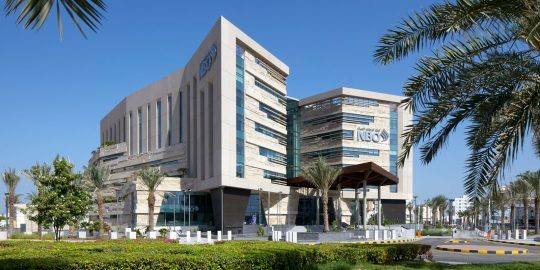 LOM’s headquarters for National Bank of Oman is one of many prestigious international head offices the architecture and design practice has completed which includes HSBC Dublin and Commercial Bank Plaza.